This is followed, after a break for lunch, by a procession to one of the sites of Martyrdom in the city at 2pm. This year we'll meet at Carfax and walk to the site of the Town Gallows at the end of Holywell Street, where a plaque commemorates the martyrdom of Bl Richard Yaxley, Bl George Nichols, Bl Thomas Belson, and Bl Humphrey Prichard, in 1589, before returning to Blackfriars for Benediction at about 3pm. Bl George Nichols and Bl. Richard Yaxley were both secular priests, who had been trained at Rheims. Nichols had studied at Brasenose College, Oxford, and became famous as the priest who was smuggled in to Oxford Castle to reconcile a highwayman to the Church on the eve of the latter’s execution. Bl. Thomas Belson was a layman, a member of a Catholic land-owning family based in Ixhill, over the county border in Buckinghamshire; Bl Humphrey Prichard was a Welshman, an employee of the Catherine Wheel Inn, which was situated on the corner of Broad Street and Magdalen Street (where part of Balliol College now stands) opposite the church of St Mary Magdalene. The four were captured in the Catherine Wheel, taken to London to be tortured, and tried and executed in Oxford. 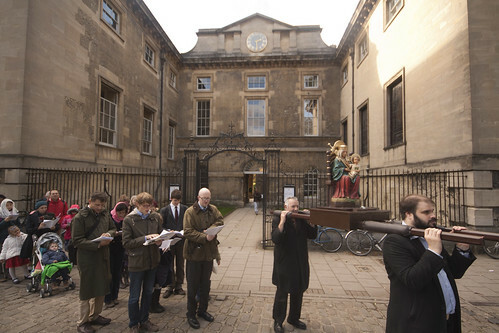 The place of execution was the Town Gallows, outside the corner of the town walls still preserved in New College, approximately where 100 Holywell Street now stands, which is marked by a plaque in their honour. In 2008, during the LMS Pilgrimage, Bishop William Kenney blessed a new plaque marking the site of the martyrdoms of 1589, on behalf of Archbishop Vincent Nichols. Bl George Napier was born in Holywell Manor in Oxford in 1550; he attended Corpus Christi but as a Catholic could not take a degree. He was ordained at Douai and returned to minister to Catholics in the Oxford area in 1603. He was captured and executed in 1610. More from the Catholic Encyclopedia here. St Joseph's Church, Bedford, houses the National Shrine to Our Lady of Guadalupe, with an image which has been touched to the original in Mexico, and goes on tours around England. 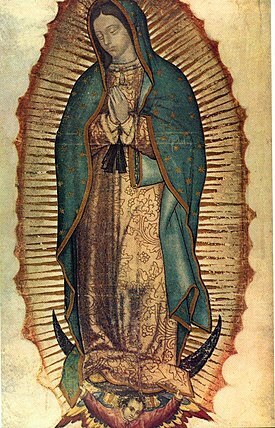 Showing the Virgin Mary pregnant with our Lord, the image has become a symbol of the international Pro-Life movement. 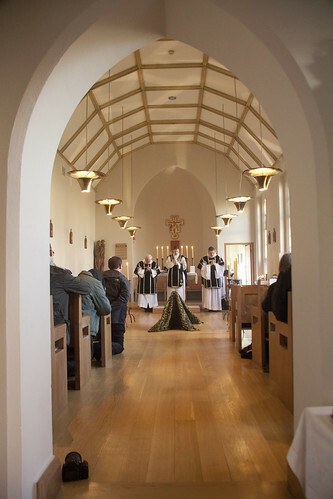 For the first time the Latin Mass Society will be organising a pilgrimage to this shrine. Mass will be accompanied with polyphony from Cantus Magnus and chant from the Schola Abelis, both under the direction of Matthew Schellhorn. by Gregorian Chant from the Schola Abelis. St Benet's is found at 38 St Giles, Oxford OX1 3LN. More photos and a report on a previous year's event here.